You can make this in different colors or one color,I’ve made them with the back and sleeves being white, and the fronts different colors; I’ve made them all one solid color.Both look very nice.I create the fronts and back as one piece to the underarm.You can work them separate if you would like to. Size J crochet hook Red Heart Super Saver 7oz yarn, 4 skeins Plastic Needle NOTE:All rows are worked from right to left…Do NOT turn the work.All single crochet is worked in back loop of stitch only.At the beginning of the row and when you get to the end of the row, hold the beginning of the row you are working and then the ending yarn of previous row up along the row you are working on and SC over it. measure around your bust, waist and hips.Use the largest # to determine how many SC you need in your beginning chain.If you are smaller, decrease the SC by 10 sc each; if you are longer; increase 10 sc until you get the length you need. Chain 183 to work as one piece to the underarm. Row 4:10sc (including beginning SC), 1dc, *9sc, 1dc, *repeat across ending with 2sc. Row 5:9sc, 1dc, 9sc, 1dc; repeat across the row ending with 3sc. Row 10:4sc, 1dc, *9sc, 1dc, 9sc, repeat across, ending with 8sc Repeat rows 3 – 10 until you get the length you need to your underarm. Lay your piece on a flat service and fold the fronts over till they meet in the middle.Mark the sides.Next you will count 10sc on both sides of that mark.I usually mark them by tying a different color yarn at those spaces.Do this on both sides.You will form your back between those marks.The fronts will be 45sc and the back 90sc. Work the pattern up 30 rows, decreasing equally until you have 24sc at the 30throw. 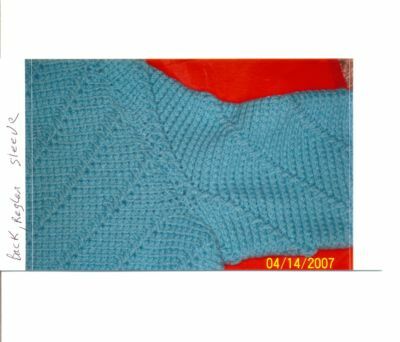 (Neckline)You will have approximately 80 rows from the border to the neck.Count how many rows you need, how many stitches you need to delete and work out something like this: Example:Row 1, dc 1 SC; row 2, dc 1 SC; row 3, 4, 5 work even. Etc. 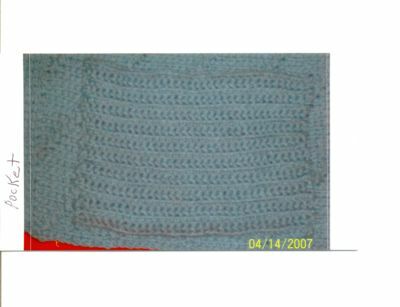 You will decrease your stitches on the armhole side of the front until you have 8 SC, leaving the edge straight.Work your pattern Example:Row 1, dc 1sc; row 2 dc 1sc; row 3-5 work even; row 6 dc 1sc; delete 1sc every row until you get to row 24.By now you should have 20sc.Continue dc until you have 8sc.Work the other front opposite of this one. RAGLAN SLEEVES (MAKE 2) – measure the length you need from the cuff to the underarm and around your arm between your elbow and underarm.Work your pattern to fit those measurements. 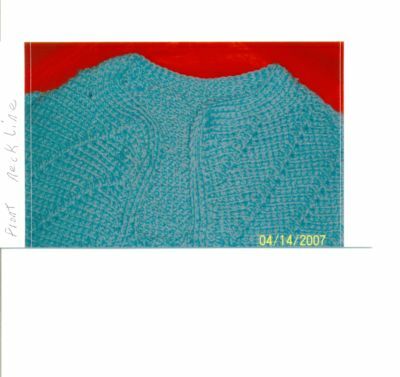 Chain 40sc = 11”.Work 3 rows even.Between rows 4 – 16 work the pattern by increasing SC until you have 57sc at row 19 = 16”.Work the 57sc until you reach your underarm, which is 50 rows.Fold your sweater sleeve in half and mark the middle.From the middle count 10sc on both sides and mark those stitches.Between those stitches you will make the top part of your sleeve to the neckline (30 rows). Between those marks decrease 1sc each row for 20 rows.By this time you should have 15sc.For the last 10 rows, work 2 rows as 12sc; 2 rows as 11sc; 2 rows as 10sc; 2 rows as 9sc and the last row will be 8sc.Tie off.